"Chuck Forman has that extra move to don't teach, you have to be born with it". Those were the words of former Hurricane head coach Fran Curci describing the God-given talents which made Chuck Forman sush a vital part of the Hurricane offense during the 1970-1972 seasons. A profilic weapon as a pass receiver, a blocker, a punt returner and more importantly a running back. Forman's name is still listed in the Hurricane record books. Season records for net yards gained, kickoff return yards, touchdowns and total points still rack in the top ten. Chuck Forman was one of the greatest running backs to ever wear the orange, green and white for the University of Miami. Foreman began showcasing his athletic talents at Fredeick High in Frederick, Maryland where he was a two-way player in football and also lettered in basketball and track. Among his talents as well were playing trumpet and singing, things he continued while at UM. Following his briliant career in the warmth of Miami, Foreman headed North to the cold of Minnesota, where he set the Vikings, and the NFL on fire. 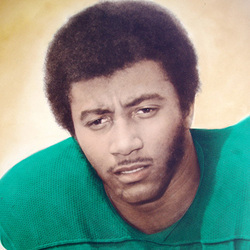 "Scorpio", as he was known from his college days, twice earned All-Pro honors. He participated in 3 Super Bowls and rolled up 5,879 yards rushing during his 8 year career with the Vikings.